Hotels-New-Zealand is a group of independently owned and non-related hotels, motels and serviced apartments providing accommodation located across Marlborough New Zealand. Hotels New Zealand allows you to deal directly with the hotels giving you the best possible rates for these Marlborough hotels. Book your accommodation online directly with the hotels in Marlborough and save !!! The Portage Resort Hotel is a popular hotel resort that provides travellers with accommodation on the door step of the Magical Kenepuru Sounds. This luxury waterfront accommodation is the perfect base for adventure, relaxation or indulgence. 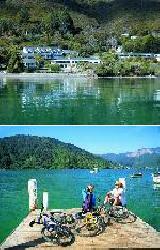 The Portage Resort Hotel is perfectly placed amongst the picturesque waterways and secluded bays of the Marlborough Sounds, only 10 minutes walk from the spectacular walking and cycling tracks that follow the legendary Queen Charlotte Sound. The Peppers Portage Resort Hotel provides all types of travellers with discount accommodation in Marlborough. It also features a wide range of modern amenities and services such as lounge bar, guest laundry, restaurant, room service and tour desk. Business facilities include FREE WIFI in all public areas of the resort and WiFi access in all hotel rooms, a business centre and conference facilities. At this Marlborough accommodation guests can choose from King vineyard suites and Queen lakeview suites that have been luxuriously appointed with all of ht emodern amenities to make your stay in Marlborough a memorable and relaxing one. All accommodation rooms have delightful views and allows guests to partake in a light or hearty breakfast in the adjoining farmside kitchen. Explore the surrounding Marlborough vineyards and their cellar doors and choose a lovely wine to accompany either your lunch or dinner.